Parents who think that children are the most important things in their busy world now have a new option. The Goddard School recently opened in Waukee on Hickman Road. The daycare mimics a school rather than a daycare, but it still strives to nurture children and their curiosity to ensure their little sponge-like minds are properly cultivated. The structured learning environment and caring teachers are two reasons why Goddard calls itself more than a daycare. Liz Smith is the on-site owner and strives to provide an atmosphere that will prepare children for social and academic success and mold them into joyful, confident learners. The Goddard School is located at 80 N.E. Carefree Lane in Waukee. For more information, call 515-297-6555 or go to www.goddardschool.com. Smoothie King’s quest is simple: Make living a healthier more active lifestyle delicious and nutritious. With more than 60 smoothies on the menu and more than 20 meal-replacement blends, customers are finding tasty and nutrient laced frozen treat are good snacking alternatives. Smoothie King is located at 1145 S.E. Alice’s Road in Waukee. Call 515-987-0262 for details or visit www.smoothieking.com for more information about the franchise. Potbelly Sandwich Shop is bringing its blend of sandwiches, salads and hand-dipped shakes to West Des Moines. This will be the second location in the Des Moines area for Potbelly — the other is in the Equitable Building at 604 Locust St. in downtown Des Moines. The opening is scheduled for this upcoming summer and will be on Mills Civic Parkway. Paul Goldammer is the owner and will run the franchise. Goldammer also owns all other Iowa Potbelly Sandwich shops. Potbelly Sandwich Shop first opened in Chicago in 1977 and now has more than 350 shops across the United States. There are also 30-plus franchise shops in the United States and abroad. Title Boxing Club West Des Moines opened the second week in January. The club offers boxing and kick-boxing classes, along with its signature Power Hour classes, 30-minute lunchtime workouts, 75-minute weekend warrior classes and other fitness options that are non-contact and geared for working your body into shape. Title Boxing Club is located at 9500 University Ave., Suite 1105 in West Des Moines. Call 515-493-4486 or visit www.titleboxingclub.com. Broheim’s Indoor Golf & Pub gives customers the opportunity to experience golf in a fun and laid-back atmosphere. The pub opened on Feb. 1 and offers state-of-the-art golf simulators. This is the first of its kind in Waukee. Broheim’s Indoor Golf & Pub aims to sustain realistic courses while offering cold pints for you and up to eight of your friends in each simulator. Broheim’s is also more than just an indoor golf simulator; it has a fully operating bar with craft beers and top-shelf liquors. The simulators provide a software package enabling Broheim’s to offer skee-ball, mini golf, a big screen TV and other gaming systems. Many consider the ability to play year-round golf to be the best part of the Broheim’s experience, plus there are none of the bugs, rain or other outdoor obstacles. Broheim’s Indoor Golf & Pub is located at 53 N.E. Carefree Lane in Waukee. Call 515-528-9192, or visit www.broheimsgolf.com for more details. If the Des Moines real estate market has a busy spring, Hubbell Homes is ready. Hubbell has two new state-of-the-art Design Studios — one in West Des Moines and the other in Des Moines. Product samples will be on hand at each studio, allowing prospective buyers the opportunity to customize flooring, cabinetry, paint, lighting and plumbing fixtures. The Hubbell Homes Design Studios feature two locations: The Design Studio Des Moines is located at Woodland Hills at 1220 N.E. 66th Ave. in Des Moines, and the Design Studio West is in Greenway Crossing at 8850 University Ave. Suite 102 in West Des Moines. A designer is available by appointment at 515-402-6743. David J. Abram II, SVP, DSM Market President at People’s Trust & Savings Bank, announced the addition of Gregory J. Baker to the Waukee Branch. Baker is a commercial lender with more than 35 years of expertise in private and commercial banking. 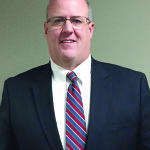 Throughout his career, he has worked in the Des Moines area and has cultivated relationships with many individuals and businesses in the region. Baker is a past president and current member of the Rotary Club of Johnston, the Metro Business Forum and the Greater Des Moines Affiliates Council. He is also a member of the Iowa Commercial Real Estate Association and multiple area Chambers of Commerce and graduate of Greater Des Moines Leadership Institute Class of 2016.